In a previous guide I showed you how to turn off the "packet data" internet connect on a Samsung Galaxy S2 by going through the menu screens. You may be happy to know that it's actually a lot, lot easier than doing that and can be done almost in an instant. If you hold the "Lock" button for a few seconds you will see a "Phone options" screen pop up like the one on the right hand side. As you can see the second option is "Data network mode" if you decide to "Disable" it, by simply pressing it, then you've turned off the mobile internet from the phone. Again to enable it you can just hold the "Lock" button and re-activate the Data network mode option. 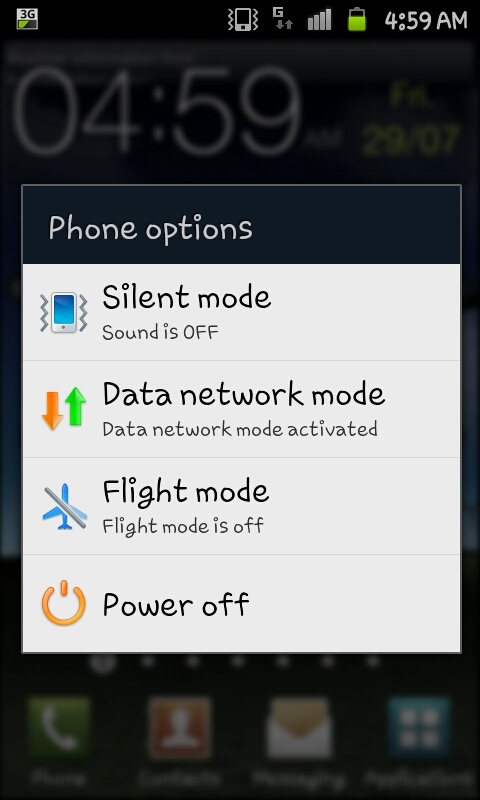 What if you don't have the option of "Data network mode" on the phone as shown above when you hold the lock button? What do you do then?